Remember we have online satellites ongoing every thursday and sunday @ 9pm on Dafa Poker. Please register through the forum to ensure you get your $15 free credit. Take advantage of this promotion to play on the biggest Poker Network in the world and qualify for our LWPS events. Hope to see you guys on board on the 18th, 19th Dec for this action packed filled weekend. Its the 1st time we are holding a total of 4 events for this series so there will never be a "pokerless" moment. Price for the ferry ticket to leisure world ? Any Promo ? Internet access on leisure world ? There is internet access on leisure world. You may choose to bring your own laptop and connect to the WIFI on Deck 7 near the KTV or use the ships computers situated in the lobby. TootToot168 wrote: Price for the ferry ticket to leisure world ? Any Promo ? The ferry ticket costs $42. You can read all about the promo in the first post of this thread. 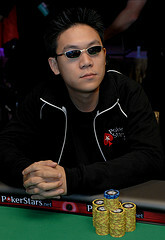 Do check out http://www.pokerkaki.com/forum/viewtopic.php?f=116&t=5063 for all boarding related info. just a couple more days before the early bird promo ends people. be sure to secure your passage before 8pm on the 11th to enjoy the promotion, which is capped at 50 cabins. playing for tourny can claim the ferry tix? or still must change NN chips? Can use the NN chips to buy in for the tournaments ? stussyboi wrote: playing for tourny can claim the ferry tix? Unfortunately no. a $300 NN chip purchase however, will get you a $40 rebate. TootToot168 wrote: Can use the NN chips to buy in for the tournaments ? NN chips cannot be used to play either tournaments or cash games. $10 + 1 + R satellites running tonight on Dafa!$15 free promo still ongoing. register yourselves now if you haven't done so. 3 hrs remaining to start the satellite, see you guys there.